A group of Midlands landowners and members of the Congaree Open Land Trust recently spent the afternoon at the S.C. Department of Natural Resources' Wateree River Heritage Preserve and WMA outside Columbia learning about ways to manage their bottomland hardwood forest properties in ways that will better protect critical habitat for a range of migratory songbirds while at the same time deriving modest income from a planned schedule of timbering. The workshop, a joint venture of the COWASEE Basin Focus Area Partners, was organized by Audubon South Carolina, the Congaree Land Trust and the S.C. Department of Natural Resources (DNR). COWASEE, short for the Congaree-Wateree-Upper Santee River system, is an area covering more than 315,000 acres in the Midlands of South Carolina including portions of Richland, Sumter, Clarendon, Calhoun and Lexington counties. With the sounds of warblers and other songbirds creating their unique music against the stunning backdrop of the Wateree River flowing by hundreds of feet below the summit of "Cook's Mountain," Wateree River's outdoor classroom provided a scenic location for the workshop. Participants also learned a little about the background and management objectives planned for Wateree River Heritage Preserve, which was acquired by the DNR in 2015. Participants also heard a presentation about the financial benefits of participating in conservation easements for landowners interested in preserving family or "legacy" properties for the benefit future generations from Congaree Land Trust Land Protection Director Mary Crocket. 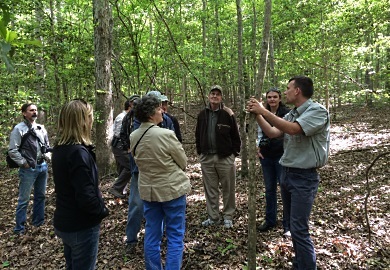 Participants also got some specific advice from Audubon staff foresters and naturalists about preserving critical habitat for migratory songbirds within bottomland hardwood forests. Audubon South Carolina manages more than 15,000 acres of bottomland hardwood forest in South Carolina. Audubon has identified the bird species that benefit most from various bottomland types and conditions. Many of these birds are species of high conservation concern that breed in the bottomland forests of the southeastern United States, including the swallow-tailed kite, and the prothonotary and Swainson's warblers. "Warblers and Acadian flycatchers depend heavily on cypress-tupelo forests," said Matt Johnson, Audubon education manager, "and approximately one-fifth (21.7 percent) of the global population prothonotary warblers nest in the coastal plain regions of North and South Carolina." That's why that species, along with 12 others, is included in the "bottomland baker's dozen," 13 high-priority birds with specific habitat needs that Audubon is working hard to protect. The list, in addition to prothonotary warblers, Swainson's warblers and Acadian flycatchers, includes: chimney swifts, hooded warblers, Northern parula warblers, Kentucky warblers, red-bellied woodpeckers, white-eyed vireos, yellow-billed cuckoos, yellow-throated warblers, yellow-throated vireos and swallow-tailed kites. And while Audubon and government agencies like the DNR have protected thousands of acres of important habitat in the last few decades through acquisitions of sensitive properties like Wateree River Heritage Preserve, which is a step in the right direction, working with private landowners to create larger contiguous areas of bird-friendly habitat is also extremely important. Many landowners who have large tracts of bottomland hardwood forest as a part of their holdings are concerned with managing those properties in a way that will be beneficial to wildlife and to future generations, but financial realities dictate that most landowners also need to derive some income from those properties in order to make continued ownership of them possible. That's where Audubon's program for studying and identifying land-management practices for bottomland hardwood forests that promote bird-friendly methods of timber harvesting and sharing those insights with landowners comes in, according to Brandon Heitkamp, Audubon resource manager. A forester by training, Heitkamp has created a 90-acre demonstration project at Audubon South Carolina's Silver Bluff property in Aiken County that shows the techniques described at the Wateree Heritage Preserve workshop in action. For example, "small patch" clear cuts of between 2 and 10 acres can provide significant income from timbering, while creating thickets of "early successional" understory growth in those cleared areas, said Heitkamp. Other strategies include selective thinning of large hardwoods, which can provide good income and will not adversely impact bird that prefer a closed canopy, so long as canopy closure is not reduced below 60 to 70 percent. This is just a sample of the techniques and strategies that landowners participating in these workshops can learn. These techniques are also valuable for managing other wildlife, including game animals such as deer and wild turkeys. Audubon South Carolina plans to hold more of these workshops around the state in the coming months, including one at the Aiken property on April 30, according to Sharon Richardson, the organization's executive director. For more information, visit the Audubon South Carolina website at: http://sc.audubon.org/conservation/working-lands or e-mail Richardson at srichardson@audubon.org.